Rating: ****1.2 out of *****. 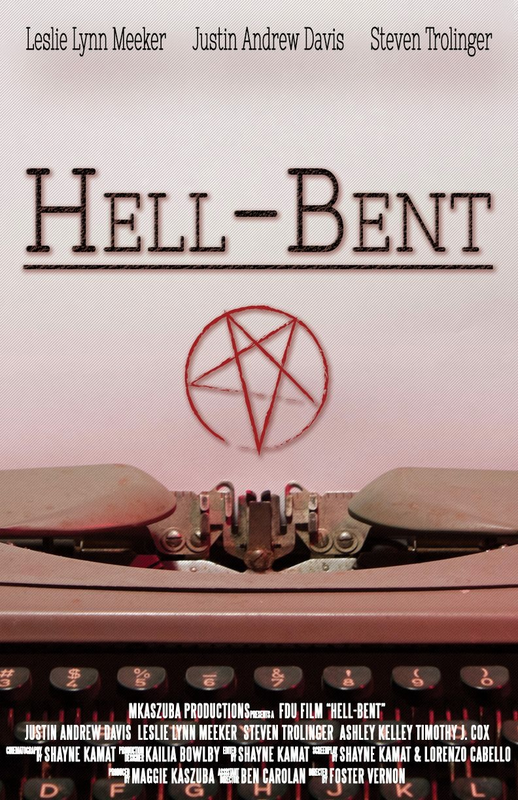 “Hell-Bent” is a deliciously dark comedy from first time director Foster Vernon and writers Lorenzo Cabello and Shayne Kamat. The twenty-six minute and forty-second short film, released through MKaszuba Productions (“Inspired“) in 2016, takes full advantage of its wise-cracking demon on the loose set-up. The laughs are rapid-fire. This is thanks to the endlessly witty dialogue Cabello and Kamat have constructed. It is also courtesy of Steven Trolinger’s dead-on performance as the unholy fiend himself, Ricky. Trolinger, whose on-screen persona has a unique resemblance to Dark Horse Comics’ Hellboy, brings a smirk-inducing charisma to his unkempt, obscenity spewing demeanor. It is one which is compulsively watchable. Such is unmistakably noticeable from our initial sighting of him, as he talks into a disconnected phone, at five minutes into the work. His portrayal is one of the many elements incorporated herein that make the proceedings play like an R-rated rendition of Tim Burton’s Beetlejuice from 1988. Even the way Trolinger carries himself seems modeled after Michael Keaton’s timeless enactment of the title personality from the previously mentioned feature. It can also be seen as a riotous parody of the evils of the laboring world. Moreover, the malevolent beings one would call upon to get ahead in it. The tale follows Michael (in a tremendously realized performance by Justin Andrew Davis). He is in constant competition with Beth (a well-orchestrated depiction by Ashley Kelley) at Brimstone Magazine. Michael is desperate to find a way to prove that he is the best writer at his place of employment. His options appear to be bleak. That is until he finds out that the upbeat and unassuming Agatha (a scene stealing, continually amusing enactment by Leslie Lynn Meeker), who labors alongside Michael, happens to have a summoning circle in her basement. It is than Michael becomes a curious, but confused, bystander to the act of bringing forth Ricky from his fiery resting place. Michael’s initial fear turns into optimism. This occurs as he sees Ricky as the perfect subject for what he is certain will be the article that makes his literary capabilities widely known. Such a premise is intriguing in its own right. Yet, the filmmakers wisely know when to take chances and when to underplay the guffaws. For instance, the best sequence in this brief endeavor is erected while Michael and Ricky stand outside a church. It is than Ricky decides to play a game called “See You in Hell”. This is where he announces the sins of those who pass by as they file out of the aforementioned building. Soon he points to the structure itself and says, “Tax evasion”. Moments such as these help fashion the piece with its constantly sharp edge. Yet, it triumphs just as well in its smaller, more understated instances. Such can be seen in the emotionally stirring typewriter shot which opens the composition. It is also visible in one of the hilarious concluding bits. In this segment, Agatha, Michael and Rickey take a picture together. This is arranged in a way that mimics the at home quaintness such arrangements often embody. It all comes together to showcase the variety at hand. This smoothly paced effort is elevated by Kamat’s impressive, immersive cinematography. He also incorporates wonderfully done editing. Marc DeBlasi gives a crisp, skillfully issued contribution to the sound department. Kailia Bowlby’s make-up is terrific. Likewise, Kiyun Sung’s visual effects fit the atmosphere of the exertion spectacularly well. They are also astonishingly and credibly issued. Such heightens the 1980’s style charm that ebbs and flows throughout the undertaking. Vernon’s direction is stalwart and even throughout. Cabello and Kamat’s writing is brilliant in structure and in quality. Timothy J. Cox is mesmerizing in his representation of Mr. Bowers. All of these components comes together to create a character oriented, effectively sidesplitting and engrossing product. Such is one that is as narratively intriguing as it is technically gripping. The quips and one-liners are triumphant in punchline and in execution. Yet, the exertion has as many gentle cases as it does boundary-pushing instances. This makes the affair so much more than a string of well-delivered cracks. It provides an undercurrent of heart and unbending concern for its leads. Such makes the depiction all the more even, varied and alive. What could’ve easily turned into a bitter outing becomes a resplendent balance of joviality, proficient filmmaking and depth. In turn, the promising young talents of Vernon, Cabello and Kamat shine. Their collective strengths, along with the rest of the terrific cast and crew, help make “Hell-Bent” a winner on all fronts. You can check out the official Facebook page for “Hell-Bent” here.